George founded this project to speed legal travel by car across this “most friendly border in the world” that is becoming more and more restrictive since the fears developed since 9/11 seem to be undermining the wonderful nature of the “americans” of North America. We are now interested in seeing if a Schengen Type area could be developed between Canada and the USA. The CAN USA Project is a small group of 4 influential people from both sides of this border plus myself trying to promote easier border crossing of this border for those eligible. First we tried innovative technology as described below. My son John and I developed an EZPass like device that would take pics of car occupants and send them along with NEXUS card data to entry ports with the idea that eligible cars could just drive through. While 2 of 10 Canadian port officers on a conference call liked the idea, there appeared to be no money. No positive communication from Homeland Security in spite of accurate contacts(persons from DHS science and technology and references) phone and email. Then we tried Politicians. result: good idea, but who will vote for me, for it? So it seems to be necessary to get public support–to influence politicians, to tell officers. So I am looking for an information advocate(s) for this project. Up beat, informational and accurate. There is no pay, but a web site could be developed with a donate button. We feel the the most affected would be small business all along this long border that would benefit from free legal citizen travel across it, so there perhaps the concept should be introduced, and spread outward. -cost savings and functional argumentation of reinforcing the common borders at the Pacific ocean, Arctic ocean, Atlantic Ocean, and Mexico for now, and removing them for people, leaving border for commercial goods. This is a huge project, but one good to get started. Don’t know if you or someone you know is willing to help or collaborate, but this email is worth a try. I have collected a lot of information over the last 4 years for your information individually and from our meetings, but I do not find writing easy. I am more of an inventor and systems person. Legal residents need a speedier ability to cross this border for commerce and tourism. We are a group of Canadian and US Citizens committed to promoting a more friendly, less time consuming, travel border between Canada and the USA for people. We support effective efforts to protect our respective national securities. 10% decline per year in cross border travel since 9/11 and the economic opportunity lost on both sides of the border associated with this decline (according to statistics from the mayor of Stanstead’s; reference Appendix #2 below). Due to longer wait and processing times, both US and Canadian visitors are choosing not to cross. This may be extrapolated all across our 3,000 mile common border (reference Appendix #3). To facilitate and enhance increased and the more timely flow of trade, commerce and travel across this border for legal residents, supply chain vendors, and time pressed businessmen, a secure, rapid vehicle /occupant processing system is needed. Such a system will help to reverse the current decline in cross border traffic and commerce, and, in doing so, promote economic growth and jobs on both sides of this border. An automobile-based EZPass type electronic device and system to seamlessly connect border authorities with security approved travelers. As the vehicle approaches the border, the device will transmit Nexus Pass type data to the border point for each occupant along with a current image of all occupants to the border officials, who can then do a facial recognition scan and verify occupant(s) identity. A pass or join the line decision can then be transmitted to the vehicle, saving a lot of traveler time and officer time. • Cost-effective (approximately $200 per electronic device).Costs for border point of entry- to be determined according to their requirements. • R. M. Burley -Chief Operating Executive F-10 company; USAF Officer and Pilot Retired. • Chuck Kezar – retired from the US Air Force reserves as a Colonel and from industry and the US government departments of Defense and Energy. We need your input and support. Visit our BLOG where you can participate and join this effort. Appendix 3 Evidence of citizen’s fear of Border. Thank you for responding so quickly to our email. Is it possible for you to meet us in Derby Line? As we checked our passports and they have expired December 2011 and with the new laws we will not be able to cross the border. Are there any laws or requirements that we must know about for bringing a dog across the border? If you meeting us is a possibility, could you bring the male pups that you have available so we could choose one? We are excited about adding a golden retriever to our family. We had a male golden for many years and enjoyed him very much. Please let us know our options for meeting with you. George’s Note: If we take pups across the Border with the possibility of sale, this would be considered a commercial entry and we would have to pay a large fee. In addition, if the pups are more than 3 months old, they require a rabies vaccination certificate which new customers normally get at their vet. Then what about bringing pups back to Canada as they are now US puppies? In the past two years, this email is typical of about three quarters of emails we have received. These people will not cross the border any more! Policies for normal citizens need to change or the economies on both sides of the border will suffer more and more as law abiding citizens of both countries refuse to break the laws and stop traveling and shopping across this “friendly border”. Large corporate interests have arranged how to cross their stuff in bulk, but the border towns and small mom and pop operations are out of luck. Most pilots of small planes attending told George that since 9/11 the USA has become unfriendly to Canadians in small planes wishing to fly to the US and they elect to not go. They used to attend air meets and spend $ in the US, but it now is too time consuming, unfriendly and expensive. They could not understand why the two most friendly countries in the world wished to degrade that relationship. Security for people and goods can be better enforced at the Atlantic, Artic, Pacific oceans and Mexico rather than at the Canada/USA border. 1) We are researching and testing an in car device that would connect to border authorities from cars approaching the border and translate adequate information to let cars proceed without stopping. Potential of a nexus pass based on EasyPass technology. 3) We are committed to supporting the replication and expansion of our efforts all along the 5,525 miles of the US-Canadian Border and are looking for political and popular support. Tour de Kingdom’s Friday International Ride-Around-the-Lake. Appendix 1 Executive Committee members and their credentials. 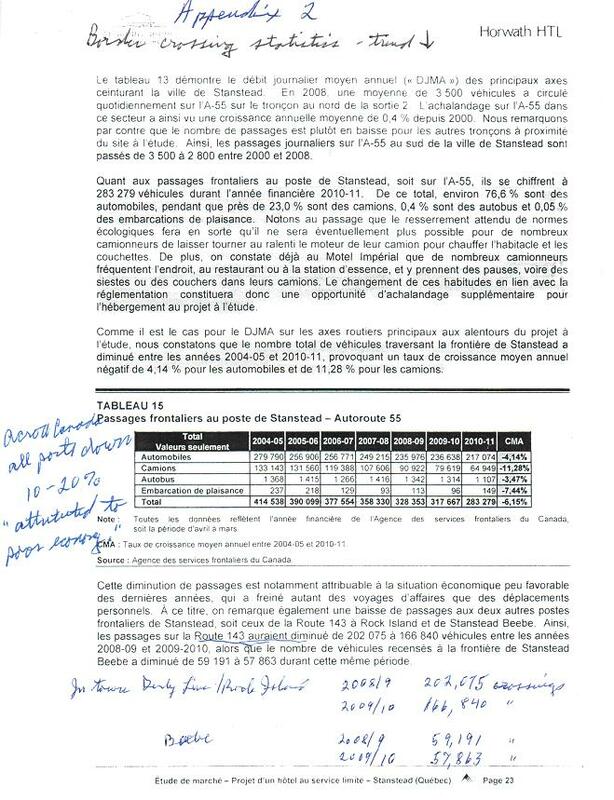 Appendix 2 Border crossing statistics & Stanstead/Derby Line traffic conditions and air photo. Appendix 4 History of CAN USA Project. Appendix 1 List of Executive Committee members and their credentials. George K. Weller, Jr. AB (chemistry), MBA Stanstead, QC – dual US/Can citizen — DOB May 6, 1940 — inventor, back to the lander, farmer, Beefalo cattle and organic vegetables; breeder of Golden Retrievers and proprietary new apple varieties; pilot and builder/operator of CTQ2, a private airport. While employed with Owens Illinois, Inc. in 1966, he discovered the lightweight armor capabilities of thermoplastics and held a secret security clearance. Organizer of the International Steam Meet in 1986, the annual Hands Across the Border Square Dance at The Haskell Library, and the Sky Fly Meet on frozen LakeMemphremagog, which in 2012 drew 41 planes from both sides of the border. Philippe Dutil – Stanstead, QC – dual citizen – Mayor of Stanstead, QC – former head of maintenance at BishopUniversity. Alec van Zuidan – Ayres Cliff, QC – dual US/Can citizen – Mayor of Ayres Cliff, QC – Member, Aerospace Industries Association of Canada (Member Small Business Supply Chain Development Working group), Member Sous-Traitance Industrielle Québec (STIQ), former Executive VP of Les Estampages ISE Stamping, Inc.,CEO & President of Mesotec; CEO & President, WULFTEC / M.J.Maillis Group. Bob Burley – US Citizen – Vermont Liaison, Recreational Aviation Foundation; Select Board Chairman; Active Commercial Pilot; Manage and operate a VT wilderness/watershed area; Retired Chief Operating Executive F-10 company; USAF Officer and Pilot; 6th Generation VT; Lived in multiple locations; USA, Europe, UK, Far East; Suit capable; prefers stained coveralls. Charles Kezar – Morgan, VT – US Citizen –Chuck Kezar spent his career dealing with government issues in science, Energy and Defense. He retired from the Air Force reserves as a Colonel and from industry and the US government as a senior policy analyst. Chuck was conceived in Canada, but raised in the US, however the VermontQuebec border has been part of his life – at times only in the summer. Now he is heavily involved in civic affairs on the Vermont side of the border and crosses often to visit relatives and experience different activities such as square dancing or other commerce. He is fully aware of the national security concerns of the border having worked with such issues during his years in the US defense department and Air Force. On February 5, 2011 George Weller held an exploratory meeting with Paul Hunt of Bradford, VT in the church hall in Derby Line, VT.
September 2011 George Weller talked live on CBC Radio about CANUSA Project with Jacqueline Czernin Host of Breakaway (4 to 6 pm weekdays) and others live on CBC at different times. My collegue Vicky Chainey Gagnon, Director of the Foreman Art Gallery of Bishop’s University, has told me about your Canusa project (and also your B&B). I am the guest curator who is organizing the exhibition “Stanstead Project or How to Cross the Border” for the Gallery.. You probably were in touch with Vicky about the upcoming visit of Vancouver artist Althea Thauberger (arriving in about two weeks)? Anyways, I just wanted to touch-base – I will be visiting Althea in Stanstead to show her around, so maybe we will have a chance to meet. I would like to hear more about your initiative and its developments. I just came back from a conference in Geneva on Mobile Borders – there is a lot to talk about, and particularly on the recent militarization of the Canadian-American border. September/October 2011 George Weller solicits members to be on the Executive Committee for the CANUSA Project. September 28, 2011 George Weller applied for grant from Niel & Louise Tillotson Foundation for web page, etc. October 14, 2011 George Weller meets with Genevieve Chevalier artist,the guest curator who is organizing the exhibition“Stanstead Project or How to Cross the Border”for the Foreman Art Gallery of Bishop’s University. It was a pleasure meeting you all. I have reserved friendlierborder.com .org and .net Go Daddy wouldn’t allow me to reserve .ca unless I was a Canadian citizen or it was a registered tradename, or I represented a Canadian, etc. If one of you wants to register the tradename in Canada we can add .ca in the near future. And a reminder, you are all invited to our Vermont’s North Country Chamber of Commerce Annual Meeting at noon on April 11th at the EastSide in Newport as my guests. Congressman Peter Welch will be speaking. I would plan to use my 2 minutes of time to introduce you and explain the mischief we are up to. Please confirm that you can come. Our next meeting as I understand it is March 17th at 9:00 am in Stanstead. I am not a lawyer. I have conducted very preliminary review of Schengen with an eye to applicability here. 1) Schengen started in 1985, BEFORE EU, so it was essentially agreement between sovereign states. 2) Pre-existing agreements are either nullified or incorporated when entities merge. 3) Schengen was adopted by EU in 1999 both because it was good for EU and because it pre-existed EU and would otherwise become a roadblock. 4) Canada and US are sovereign states with little likelyhood (in our lifetimes) of an EU like Schengen agreement. Impression: While Schengen will provide us guidance for processes and procedures that work, any formal agreement at the sovereign- national level will be an arduous undertaking. I wonder if there is possible implementation at the Province/State level in the form of regional agreements which would create “proof points” for the longer journey. The question at least from the US standpoint is what is within the rights of a Province/State to negotiate. Knowing that, we can pick some small areas to execute as “demonstration” tests to build on. Example: documenting the border swim and the border flyin and perhaps enhancing them with some form of “approved advanced identification” Could be done with a CBP-RCMP data base of “certified” individuals???? To meet the “Perimeter Security” and “Commerce” intentions, small test cases between farmers and forest products could go a long way. March 6, 2012 George Weller gave a short talk about our project to the Newport Rotary. It was well received. A Rotary member, a retired 40 year veteran of the FBI in NYC, who now lives here and fishes a lot on LakeMemphremagog, was very insistent that something needed to be done about the border. It is way too uncoordinated and officious. It makes potential visitors turn away. I was surprised at his passion. Those who had traveled to Europe enjoyed the Schengen freedom of travel. From recent emails, it seems that implementation of a Schengen like agreement is more an officialdom problem than a technology problem. From talking with many citizens of northern Vermont about the border, more than 95% are strongly in favor of a more open border like they remember it in past years. They complain about not being able to visit relatives, getting back into the US if going to Canada, etc. They might vote for someone who helped make the border better. 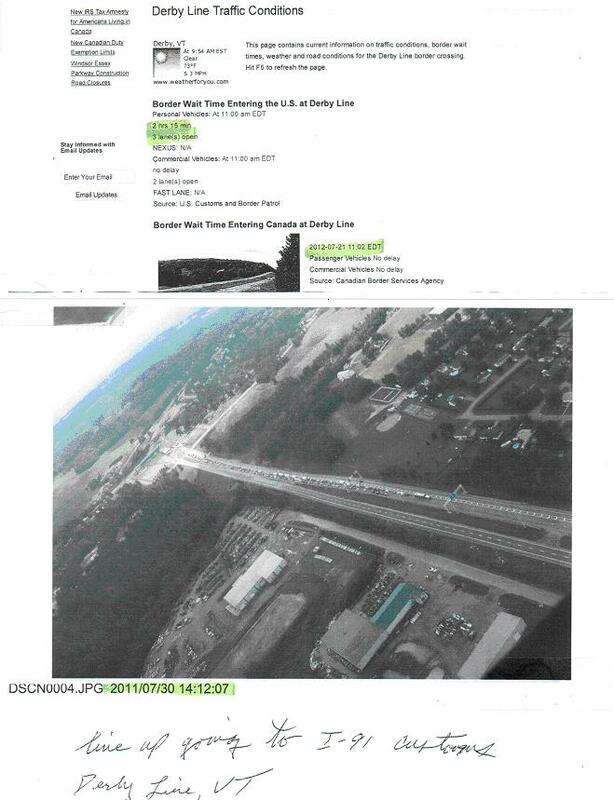 At a meeting of the CAN USA PROJECT Committee on Jan 5, 2013 , John Weller gave a demonstration of a simple electronic system that would be activated approaching the Border and take pictures of vehicle occupants and send then and NEXUS type data to the port of entry. Then the entry port could direct the car to go on, or stop and report.